Cover picture: Astrophytums are quite rightly popular cacti for growers with their large flowers and interesting shapes and spination, (or lack of it). There are six species listed in The NCL which includes the new (2005) A. caput-medusae and surprisingly A. coahuilense. This species looks very like A. myriostigma. The plant on the cover was purchased as A asterias and grew well, perhaps too well for a pure asterias The body is also slightly higher in the shoulder and those flowers are just too sumptuous for the real thing. Still it is much loved here and does OK on the show bench. As to a picture of the hobbyist most associated with Mesembs in the UK there was no image available here. But there was after her talk in September. Just as a BTW, among succulents there is also a Euphorbia susannae The Aloe and Lithops subspecies are both suzannae. Your Ed seems to apply the names randomly to his plant labels as do a great many on the internet. BTW2 Other species named suzannae occur in Baikiaaea, Myrina, Nesovitrea, Nesogordonia, Eritris, Encholinium, Conus, Orchis, Trichiscus, Pecteilis, Entomobrya, Pleurifera, Hygrophorus and an Anthraxia, among others no doubt. I think I have spelt them correctly, (though Mrs. Dell doesn’t.) Certainly not all plants and if you are bored over Christmas you can research what they are. Just for fun one of these doesn’t exist (as a suzannae), I created it. One of the interesting uses of digital cameras is as a record of plant growth. We think maybe a plant grows quickly or slowly but the photo record provides a definite answer. So it was: In September 2008, I was looking at the photograph of my little treasures bought in September 2005, three years earlier at the Judges’ Course. Among the succulents Echeveria ‘Fantasia’ cristate was the winning grower. A few inches in 2005 had filled a 8 inch pan and pieces broken from it and rooted had recovered the cost several fold. A simple calculation says that, if this rate of growth continued and the plant was potted on, it would fill a 8’ x 6’ amateur’s greenhouse in four years. In a geologically short time it would cover the Earth. I’d better compost it now! None of the others had matched this phenomenal growth rate. In fact my purchase of Echinocereus fitchii seemed to have disappeared completely. And I never noticed its passing. The hybrid Crassula deceptor X susannae had a main head and a couple of pups. Now it has over a dozen and fills a three inch pot. It is a neat hybrid and definitely grows well but has not the elegance of the named clone ‘Celia’ which more resembles a robust susannae. Among the remainder there was what I would consider normal growth. Dudleya attenuata SBF392 was a bit disappointing, tending towards legginess and would have to go, despite fond memories of Sonia, The ISI form of this plant is far more compact and attractive. Of course this species will never set the world on fire with its flowers! So here’s the tip; when you have the digi-camera out to take that award winning image, snap a few general shots of your collection. Over the years you can see them grow! I was chatting to Warren Withers and he was recalling a correspondent he had years ago in Colorado called ‘Cresty Newt’. Cresty was a bit of a traveller and only collected his mail irregularly. He signed his name in huge bold letters across the page. Warren remembered he had a plant named after him… I couldn’t quickly think of any crestynewtii or newtii plants in cultivation but Warren then remembered that his surname was Paradine. BTW, did you know that Warren’s actual first name is Eric? The past year has bought us some novel and exciting events. We arranged the sell-out Zone Convention with two outstanding speakers enjoyed by over a hundred people. By all accounts the Auction was a lot of fun and the plants that changed hands benefited everyone, vendors, buyers and the branch. Our sales team has been active bringing both plants and the ‘cactus world’ to eight venues around Northants’ country. And of course the National Show. Phew! Next year Roland has conjured up an excellent programme of talks and events for us. I see Mammillarias, Gymnocalycium, Matucana and Conophytum featured as specific plant talks. Also Jeff Ollerton, the local University's expert on the Apocynaceae, (which these days includes Ceropegia, Hoya, Adenium, Pachypodium and stapeliads, among others.) Then there are habitat talks on the succulents of South America, the US and Baja California and the alpines of Chile. Wow! They are in my diary already. NN’s contributors have been sharpening their pens and focussing their brownies especially for you. Enjoy! Everyone can tell GPS stories, or these days especially Sat-Nav ones. The GPS is a wonderful device. It can ‘see’ special Earth orbiting satellites and compute your position in the world to a few yards. Sorry metres. (Though it is not that clever, you generally have to tell it what country you are in if you are a globe trotter.) Coupled with some road information it is that wonderful gadget called ‘Sat-Nav’. You can find your way anywhere if you have the software; though maybe not by the route you would have chosen from a map. GPS locations, or the longitude and latitude of plants in habitat are very useful to those who seek these plants. On digital maps and Google Earth it enables us to ‘see’ the terrain, record altitudes, get some insights into the geology and calculate the distance from towns and road junctions Details entered into our machines will enable us to arrive at a location within a few yards of a specific plant or the centre of a colony. It can be plants we have seen before or new places given us by friends. Just enter ‘Go to’ and drive or walk in the direction of the arrow. Infallible? Well mostly. But GPS information is subject to human error; a twitch in the recording or entering on your GPS can send you miles away. I was fairly close to a rare cactus in the US and entered the GPS I had been given. It was 5000 miles… that way. I had entered E instead of W. It happens. When I made the correction I was a few hundred yards, (sorry metres) away. Still, this little story is about GPS locations for interesting plants in the US and all had good GPS info. Then there was the human influence. Let’s see. As I arrived Richard had emailed me info about a location for Echinomastus erectocentrus (or E, N or S erectocentrus as we are calling this these days. Covers all taxonomix, I mean taxonomic possibilities.) It was by Interstate 70 but he had confused the junction number in a previous email. The details confirmed the actual junction and talked of the Frontage Road and had the GPS for many plants. Now Frontage Roads are the roads that run adjacent to American Freeways from the junctions and sometimes have ‘Gas’ stations and other services. This lot were a bit complicated and after driving outwards through every point of the compass I plumbed in the GPS for the first of Richard’s locations to sort them out. The GPS location quickly found where he had probably parked his car. It was getting dark and rather than read the details of his email and other locations I quickly scouted up the ‘meadow’ beside a stream towards the ‘Freeway’. I immediately found many E. (or N. or S.) erectocentrus in flower. The light was so bad that the final pictures were taken with fill-in flash. Richard reckoned there were forty plants here and I could agree that was about right. When I got back to my car I read his email again, (I needed the car’s interior light). All his plants were over the nearby fence. I had been in a different area. So at least 80 plants there! I knew Richard’s itinerary and a few weeks later I met him ‘en route’. We had lots to talk about and Richard gave me two further specific locations to watch out for. 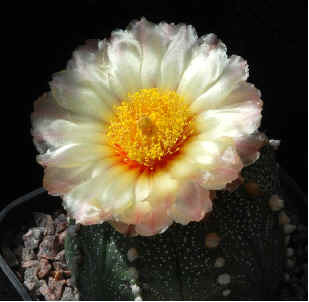 The first was a Sclerocactus ‘polyancistrus’ in Nevada. I popped the ‘polyancistrus’ in inverted commas because the plants here and nearby are not quite like the regular polys of the south. This is also S. nyensis country. I had Richard’s GPS locations for four plants but time was running out; the sun was setting. I also had an historical location for the same plant a few miles away. Thinking on my feet, or in this case from the seat of my car, Richard surely had good pictures from his location we could share. I stopped at the old location. There was a hill and I yomped up it to gawp at a terrific ‘only in Nevada’ view which went on forever. Mountain range after range. Those Nevada sunsets… As the light failed I walked along the ridge. No cacti; no polys. (I say no cacti but my camera seems to have snapped some Echinocereus engelmannii on the way.) I chose the quick direct route down and in the sagebrush quite near my car I found the plants I sought. And babies! I have never seen seedling Sclerocactus polyancistrus in habitat. Most scleros have weakly spined seedlings but these had big hooked spines over the top. Very different. I took indifferent pictures using the available light and some by flash. Driving on, I passed Richard’s location. Were his plants the same as those I had just seen? I really had to know, even if it was by torchlight. I plumbed in the co-ordinates and walked straight to a plant which was identical to those I had just seen. Not much later I would probably have to use the light on the GPS. And a torch. Anyway, I took the picture of that plant with flash. Two days later I was at Beatty, still in Nevada, and Richard had jotted down a GPS location for ‘the biggest polyancistrus ever’. It was ‘on the col between two hills’ he said. I bought a sandwich in Beatty and entered the coordinates. Down the turn and the GPS was warm, I pulled into a lay-by right by the GPS location. So Richard had recorded the car park, no matter, I could see the hills and their col across the road. I still had that sandwich to eat and the hill looked a bit steep so munching as I walked I wandered around the car side of the road for half an hour. It was flat(tish) with nothing that interested me. I returned to the car, picked up my cameras, tripod, water, GPS; the usual things for a stroll in the desert and set off up those hills. Great, thanks Richard! In the col between the hills was a colony of Sclerocactus polyancistrus so dense I could barely walk between them. I have seen the species many times before, but never like this. But where was Richard’s ‘biggest ever’? Casting further afield I found a fairly big one. No, I had seen one as big at one of David Minnion’s locations earlier that day. And much, much bigger at Barstow. Having taken pictures of the plants there, which were in nearly mature fruit and must have been spectacular when Richard was there, I descended the hills in a spiral fashion. Worth it this time because I found more ‘polys’ and nice plants of Echinocactus polyancistrus. Quite often these two polys grow together. When I got back I chatted with Richard about this location. Oh, dear. Still that is two places where Sclerocactus polyancistrus is recorded. Search one side of the road for the biggest ever, and on the other for the densest colony ever. Take your choice, or do both. I have the GPSs! And if you climb the hill you will see Echinocactus polycephalus in densely red and yellow spined forms as well; worth the walk! Conversely I was able to give Richard, who was travelling with Don Campbell, some information on plants to see. I always thought we all visited Sclerocactus cloverae at the same place near Navajo Lake, our pictures were of similar plants. It is a place I have given to several of my friends including Don. When we met I gave them specific locations for concentrations of this species here which were about to be in full bloom. Turned out these were a different place from those they had been visiting. While I was in Canyon de Chelly I sought a few old friends – in this case Sclerocactus whipplei on the trail to the White House ruin. The ‘real’ thing with small yellow flowers, dense spines, and in particular a flattened central, up and over the top. In the canyon my GPSs of old plants were not very helpful. However I found a few others in flower. (And GPSed them.) Remembering I had GPSed a large plant on the rim in 2003, should I try to track it down? Here was a dilemma; it was getting late, should I take some photos at the Spider Rock overlook first? I took the sunset landscape pictures then idly entered the ‘nearest WP’, (waypoint) which was the 2003 plant, before I drove back to my campsite. Walking around in the gloom I despaired of finding it until it ‘popped’ out of the ground. Using the full repertoire of tricks in the camera I was able to capture a ‘sorta’ picture. Then I cheated and took some with flash. The plant was in bud. However I knew that Richard was booked into the local hotel in a few days. Surely he would like to snap some shots of Spider Rock. Then surely he would pass TW1103 with a single large plant of Sclerocactus whipplei. I jotted the location onto a serviette at the restaurant in Marble Canyon. Great! Richard was there and captured the moment. Whipplei in full flower! So that’s the GPS in action. A most useful tool for cactophiles in habitat. *Google Earth is free software you can download with aerial images of the world’s surface. Sometimes in great detail, you can see the car on my drive and even the people in London, also sometimes large cacti (or shadows) in habitat, but the resolution varies a bit which is frustrating. The mouse point traces the longitude, latitude and altitude. A software gimmick gives the appearance of 3D which can help to visualise the terrain and I had a laugh when a friend tried to look in his back window. You can stick named ‘map pins’ in to represent field locations. Another useful tool.